The property market in Argyll and Oban has experienced a strong start to the year with a surge in both the supply and demand of high quality homes. During the first quarter of the year (January to March 2017) the firm's regional agents for Argyll handled more than double the number of offers compared to the corresponding period of 2016. There was also a rise in the number of new property applications and healthy buyer activity at all price levels. However, despite this surge in buyer activity, demand continues to exceed the number of new properties coming to the market across the region. Oban and the surrounding areas continue to be very popular visitor destinations throughout the year and for buyers looking further afield, an excellent point from which to explore Argyll and the Isles. Our new window presence in Oban has significantly boosted interest and provides a very effective way to showcase a selection of our best properties across Argyll. Clients appreciate our hands on, bespoke approach, coupled with our in-depth local knowledge. Having someone on the ground is a huge plus for our buyers and sellers, we will always go out of our way to provide an excellent service and invaluable advice. Despite the upcoming national election, demand holds strong and competition is high when good quality homes in prime locations come onto the market. Sellers considering moving during the summer are now in a prime position to achieve good offers. Galbraith operates a network of regional offices across Scotland and figures for the firm as a whole during the last quarter of 2017 show a rise in sales of 7% compared to the same period in 2016, with 19% more properties being brought to the open market and 49% more applicant registrations. This activity equated to 47 million worth of property sales being handled by the firm over the past quarter alone. Bachuil House & Hawthorn Cottage are located on the beautiful island of Lismore which forms part of the Inner Hebrides on the west coast of Scotland, a group of small islands famous for their stunning views, sandy beaches, world class sailing and temperate climate. Bachuil House, which was built in 1864 and extended in the 1960s, is B listed and sits on land that has been in the same family ownership since the 6th century. The house has been refurbished and currently provides AA four star B&B accommodation, while recently renovated Hawthorn Cottage within the grounds has the potential to offer supplementary or letting accommodation. 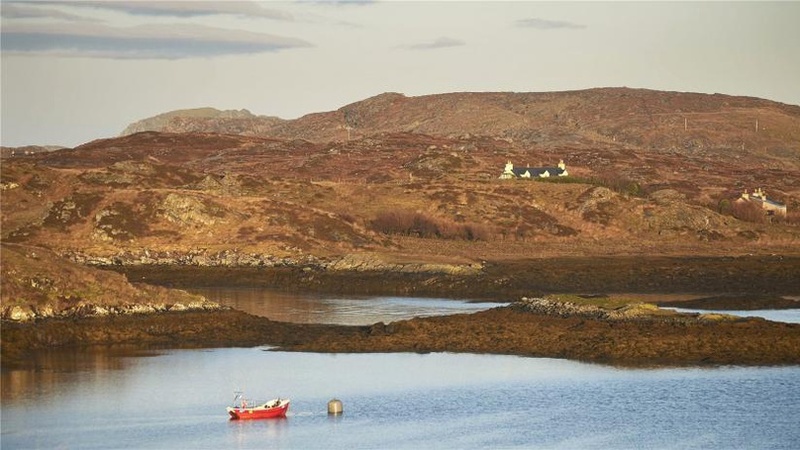 Tigh Na Sith enjoys a truly idyllic setting, situated across a sheltered lagoon on Great Bernera - part of the Outer Hebridean Island of Lewis. The house which dates from about 1910, has been extended by the current owners to provide very comfortable, contemporary accommodation including a delightful 'spa style' relaxation suite with indoor Endless Pool and sauna, modern kitchen and refurbished bathroom and shower room. The three bedroom, detached property is surrounded by very pretty garden grounds and from the first floor is access to a large deck with panoramic views of the Atlantic. Orsay Housea most impressive and generously proportioned property which dates back more than 100 years, is situated in the middle of a small street overlooking the open sea in the delightful conservation village of Portnahaven on the stunning Inner Hebridean island of Islay. The spacious, four double bedroom home has been extensively enhanced by the current owners and includes a generously sized dining kitchen, en-suite facilities to both floors, restored fire places, solid wooden flooring and new oil fired boiler.